We are delighted to announce our new integration with Yotpo. You will learn it all here. Chapter 2: What is the Integration All About? Chapter 1: What is Yotpo? Yotpo is a full suite of solutions for customer reviews, visual marketing, loyalty programs and referrals. It is a complete commerce marketing cloud made to satisfy your customers and enhance their online experience. Let me explain what each one of them does. With reviews, you can simply turn your user-generated content (customer content) into sales. By creating and displaying aesthetically appealing on-site messages on your product pages, you can improve your social proof and prompt visitors to buy. Moreover, with discount-sensitive messages you can send with Yotpo, you can get people to leave a review and thus buy more of your products. This way, you can build trust, improve the customer journey and the customer experience in general. Yotpo integrates with major eCommerce software like Shopify and Magento — you can find a list of all the integrations here. Let’s move on to the next one. Visual marketing allows you to build curated Instagram galleries and add a shoppable Instagram page to your online store. With loyalty and referrals, you can build customised loyalty and referral programs to engage existing customers and reach new ones. This way, you can acquire new customers in a cost-efficient way. Last but certainly not least, we have consumer insights. This feature allows you to gather and analyse customer feedback at scale. This way, you can understand your customers better and thus provide them with a superior overall experience. Let’s jump to the next section where I’ll tell you everything you need to know about the integration and what it is all about. Stick with me here if you want to learn more. Integrating Flashchat with Yotpo enables your store to include User Generated Content & promoted products in Messenger Abandoned Cart Campaigns. 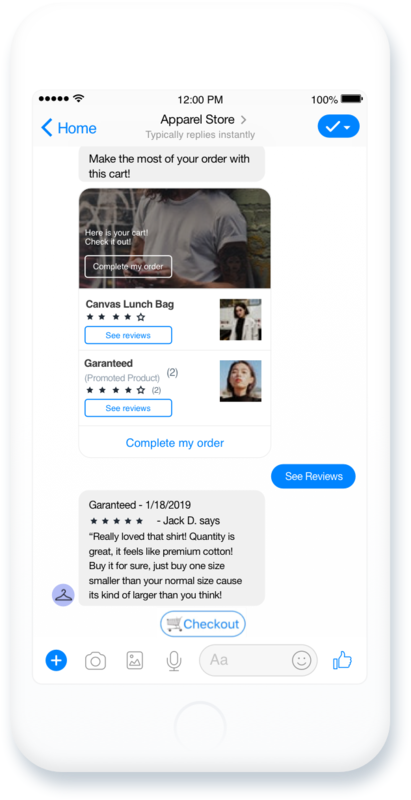 Yotpo’s FlashChat integration helps merchants to automate Abandoned Cart Campaigns using Facebook Messenger and include ratings, reviews and promoted products. Messenger Abandoned Cart Campaigns become more persuasive and merchants recover more lost sales with an upsell way. Flashchat is a Messenger Marketing Platform that enables Shopify merchants to automate Messenger Conversations that recover abandoned carts & increase their sales on autopilot. In order to start automating Abandoned Cart Campaign that include UGC, you need first to build your Messenger audience that will be eligible to receive messages from your store in their Messenger inbox. To do so, you can simply activate Flashchat’s Home-screen PopUps and widgets that contain messenger checkbox that enables your store visitors to give their consent with a frictionless way. You can customize your Home-screen PopUps and widgets, including dicount & offers in order to maximize opt-in rates. The Messenger widget have to be checked (almost 9 out of 10 times it’s not pre-checked) for someone to join your Messenger list. This way, you’ll be able to turn website visitors into Messenger audience that you can re-target through highly-relevant Messenger campaigns. Besides that, you can include social proof to your product recommendations and thus prompt users to reach a buying decision quicker. It is important to understand that — even though powerful — the integration goes hand in hand with a superior product quality and a great customer experience. This means that you can’t expect people who communicate with you on Messenger or abandon their shopping carts to buy unless you provide them with an amazing overall experience. 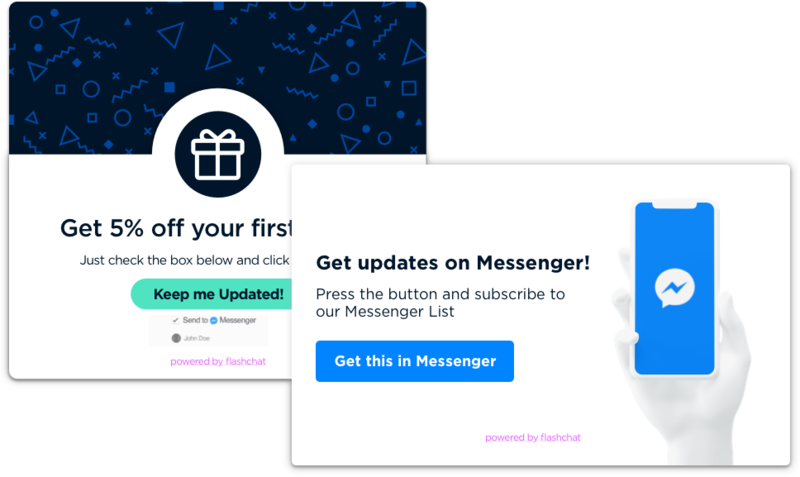 Build your Messenger Audience – Use Flashchat’s “Add to Cart Widgets” & “Messenger PopUps” to build a list of users eligible to receive Messenger Campaigns. Recover lost sales with Upsell – Automate Abandoned Cart Campaigns through Facebook Messenger that include rating, reviews & promoted products. Generate New Sales – Generate new sales by sending updates & Win-Back Facebook Messenger Campaigns that constantly increase sales opportunities. Note that both Apps are free to install. Next, you have to add the Yotpo Reviews Widget to your online store. After you log in to your Shopify Admin dashboard and you’ve successfully downloaded and installed the Flashchat App, you can choose the Facebook page you want to use the App for. After you’ve successfully connected the page you want to use Flashchat with, you can enable abandoned cart reminders and start tweaking text, timing rules and your discounts. Doing so, you will be able to send abandoned cart reminders with strong social proof that will capture your visitors’ attention and get them to buy the carts they abandoned. As I’ve mentioned in a previous article, to get the most out of an integration, you have to pay attention to your overall presence. You also have to take care of your customer service, your product quality and all other critical aspects of running an online business. This is the only way to leverage the true power of Messenger and social proof. This will create a new sales channel for your business and ultimately help you increase your sales and get better results overall. All you have to do is get both of the Apps installed on your online store and you are good to go.